We’ve completely redesigned the Contour remote control with a smaller, easier to handle frame and buttons that help you find exactly what you’re looking for. Plus, easily find shows, movies, and other content by speaking into your remote. "Five minute workouts on YouTube"
"What football games are on today?" "When is the next Falcon's game?" Are my entry lights on? What is the temperature inside? 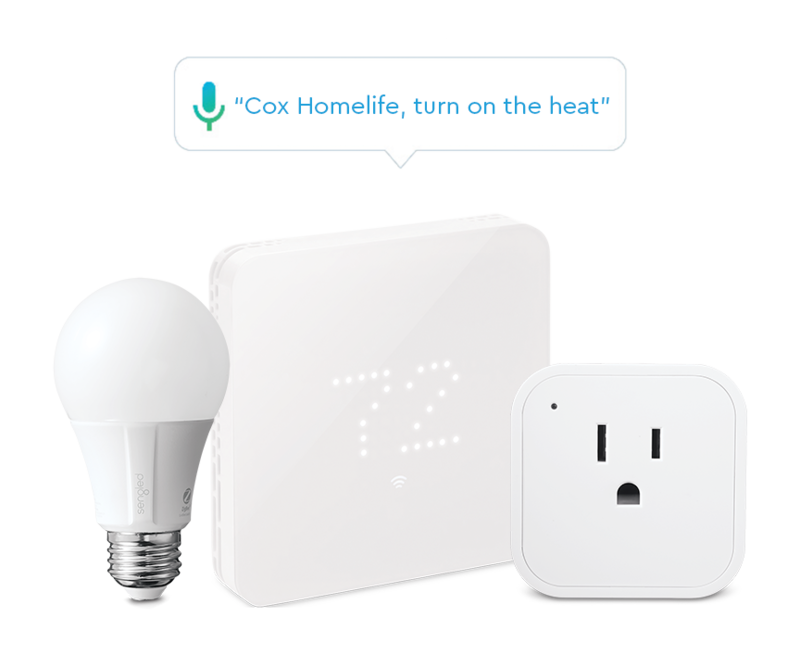 If your command doesn’t immediately work, try saying “Cox Homelife” first. Make sure to give your Homelife devices unique names with no numbers so it’s easy for the voice remote to know which equipment you want to control. You can rename your equipment in the Homelife portal or the Cox Homelife app. Click the blue circles below to learn about each button. Don’t see your remote? Find yours at remotes.cox.com. B: Display the Accessibility menu to change settings for features like closed captioning, enhanced text readability and voice guidance. Your remote can be programmed to control your set top box, TV and audio device. Press and hold the Setup button until the LED on your remote turns green. Input the three-digit code on screen using the remote keypad. Then press OK to pair the remote to your set top box. Pair your remote to your TV by holding the Setup button, typing in your TV’s manufacturer code using the remote keypad and pressing OK. The LED light on your remote should blink green twice. Program your remote to your audio equipment by holding the Setup button, typing in the equipment’s manufacturer code using the remote keypad and pressing OK. The LED light on your remote should blink green twice. Press the Guide then Fast Forward button to see what’s airing 24 hours from now. While in the Guide menu, press the B button to see a video window of what you’re currently watching. Press the Guide button twice to select from one of multiple Guide Views and filter by Favorites, Movies and more. Press the D button to quickly delete a recording or cancel a scheduled recording. When turned on, Voice Guidance reads the contents of the screen out loud, including program descriptions and navigation instructions. Voice Guidance is available on the following screens: Guide, Main Menu, Mini Guide, Saved Menu, Settings Menu. Tap the A key to open the Help screen and again to bring up the Voice Guidance screen. Select “Turn On Voice Guidance” to activate. Once activated, press the Menu button and Voice Guidance says the correct actions to talk out loud. Voice Guidance offers details on current or upcoming programming. Learn more about the features, setup, and use of your Cox remote control. Learn how to troubleshoot your Contour 2 TV service and equipment.